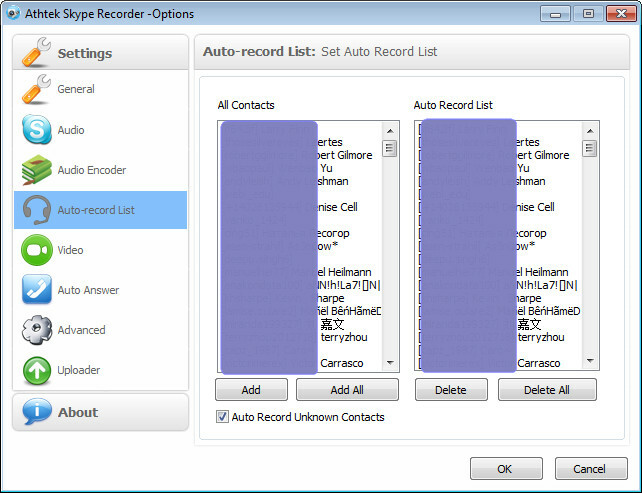 [PDF] We can record all Skype calls automatically by using AthTek Skype Recorder. But not all the Skype calls need to be recorded. If we have many Skype calls every day, it will waste a lot of disk space to save those useless recordings. In this article, you will learn how to record Skype call from specific contacts automatically. 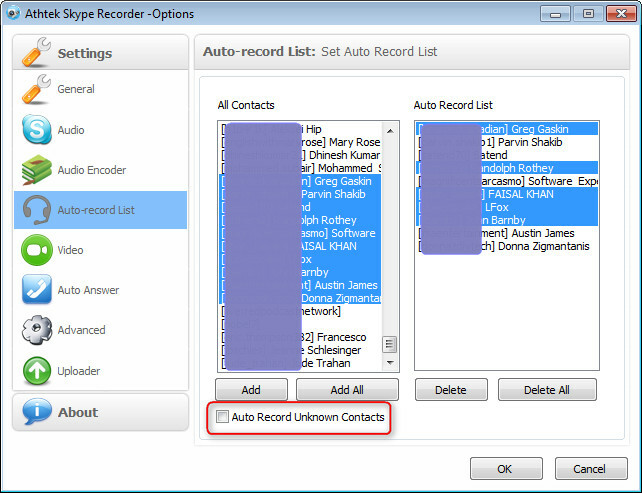 You can make an auto-record list to exclude those Skype contacts you don’t want to record. Please go to [Tools] > [Options…] > [Auto-record List], and you will see all the Skype contacts are in Auto-record List as default. Now you can delete the contacts which you don’t want to record Skype calls from them. Simply select multiple contacts and then click Delete to do that. If you don’t want to record Skype calls from people who are not your contacts, please uncheck the option of “Auto Record Unknown Contacts”. Press OK to save the settings. Now, only the Skype calls from listed contacts will be recorded and saved automatically. If you want to get the default settings back, simply press the button Add All and all the contacts will be added to Auto-record List.